There is a bit more to it when trying to create a button in Android and setting a listener to it. The new way hides a lot of the complexity but it also hides a lot of the understanding. This can be a bit hard to understand when you first start learning about it. The key is to break it down. 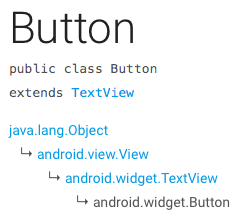 A Button is a sub class of View (https://developer.android.com/reference/android/widget/Button.html) as you can see from below. This means that for a Button object, btn you can do btn.setOnClickListener. So far so good? It takes a View.OnClickListener l.
But this is tedious to do each time you want to set a click listener. Therefore, you can provide the implementation on the spot as shown above.